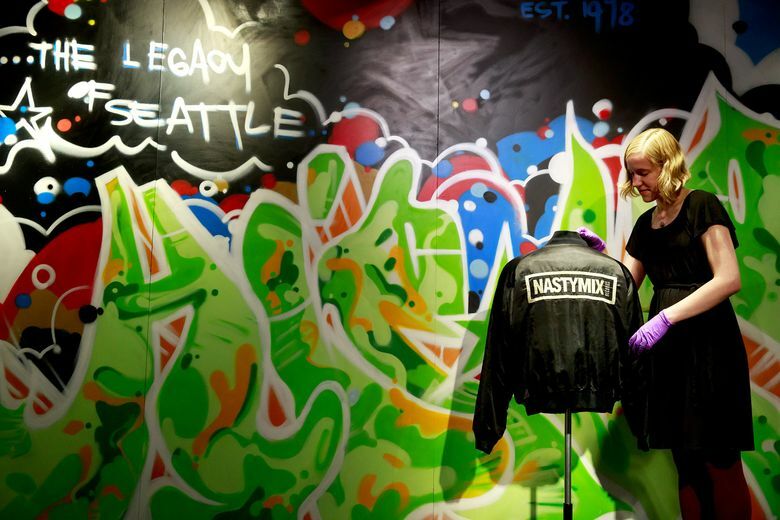 “The Legacy of Seattle Hip-Hop,” which runs through May 1, uses mixtapes, posters, clothes and hands-on stations to illustrate the local roots of the genre, from the Emerald Street Boys to Macklemore. To the wider world, Seattle hip-hop boils down to two pop breakthroughs: Sir Mix-A-Lot and Macklemore. But a closer look shows we have a complex scene going back 36 years, since the Emerald Street Boys kicked things off in 1979. That history is the subject for MOHAI’s exhibit “The Legacy of Seattle Hip-Hop,” running Sept. 19-May 1. “Legacy” is essential history for native Seattleites and those who recently moved here, as the birthplace of local hip-hop, the Central District, rapidly gentrifies and cultural context disappears. Now is the time to remember the originators. 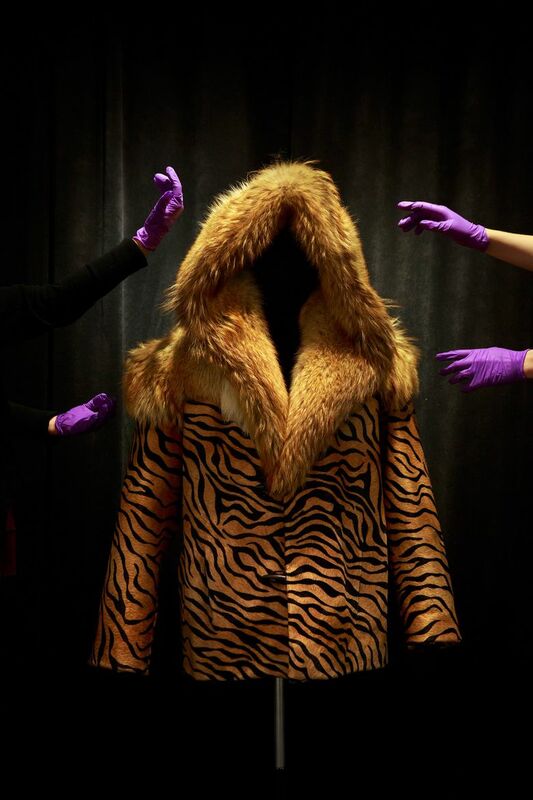 She’s talking about Macklemore, of course, and the fur coat he sported in the 2012 music video for his platinum hit “Thrift Shop” is in the exhibition. At the very least, “Legacy” addresses the unequal representation by showcasing artifacts, written history and interactive audio from Seattle’s early hip-hop scene. The most creative aspect of the exhibit is two mixing stations, which will play compositions by Jake One and Vitamin D, songs that visitors can control track by track, using the mixing board. Those sounds will float in the background as attendees check out Solo Doe’s nameplate belt buckle; old issues of The Flavor magazine; DJ Topspin’s four-track recorder; mixtapes, posters and concert fliers galore; and a huge graffiti mural commissioned from artist/rapper SPECSWIZARD, who started making music in Seattle in the early 1980s. And don’t miss the short movie about the Emerald Street Boys, by Scott, co-curator Aaron Walker-Loud and director Avi Loud. There is an inordinate focus on the late ’90s-early 2000s in the exhibit, and nothing that captures our artistically exciting present (check out Thraxxhouse, Moor Gang and Black Constellation). Grammy-winning rapper/producer Ishmael Butler deserves his own wing and doesn’t get it. Other figures are understandably absent, as curators were at the mercy of donors for artifacts. And there are cases like DJ Kamikaze, who changed the game but is now impossible to track down. Seattle rap history is having a moment. In May, the Folklife fest devoted significant programming time to tracing African and hip-hop traditions in the city. Later this year, we’ll get Dr. Daudi Abe’s book, “Emerald Street: A History of Seattle Hip-Hop 1979-2015.” A feature-length documentary about Vitamin D and his musical family is reportedly in the works. The more exhibits, books and films we get on this topic, the more complete picture we’ll have. Exhibit opens Saturday, Sept. 19 (opening-day celebration includes DJs, dance, art and a public graffiti wall) and continues through May 1, 2016. Museum hours are 10 a.m.-5 p.m. daily, MOHAI, 860 Terry Ave. N., Seattle; $14-$17 (206-324-1126 or mohai.org).